Need to extend your USB cable without signal loss? 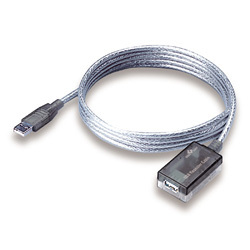 This USB 2.0 Active Repeater Cable can easily extend your USB 2.0 cable of 12 meters; you can even cascade these repeater cables for a maximum length of 36 meters, and the third active repeater is able to provide more than 200mA. It can support Self-Powered USB device or the USB devices whose power consumption is below 950 mW (200mA). Comparing with a "passive" repeater cable, our cable is an "active" one that buffers and regenerates upstream and downstream signals to ensure signal reliability and performance. The USB 2.0 repeater cable support data transfer rates of up to 480Mbps and is fully backward compatible with USB 1.1 devices. Therefore, both high speed and full speed (including low-speed) USB devices/cables will function equally well with the USB repeater cable.